Baumann are expanding personalised training programmes for their side loader customers, as part of changes to their UK distribution network. 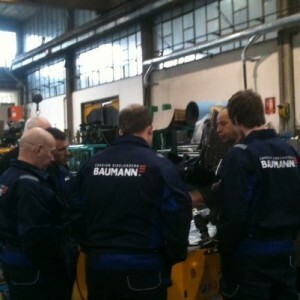 The training consists of a mix of classroom and structured practical work, both in the UK and at the Baumann head office in Italy. Once a new side loader has been delivered direct to the customer and commissioned, Baumann initiate a full product training programme. Andrew Burton, of Baumann UK, said: “Baumann only produces side loaders, nothing else, so we have been able to develop individual support programmes for all our customers, based on having a unique product knowledge and understanding. As well as training in the UK, customers will also experience the main production line at the Cavaion plant. By working alongside Bauman technicians, fellow engineers will learn to strip, refurbish and even build new units. Mr Burton added: “Baumann training tends to concentrate on the practical elements of the side loader range as our experience tells us that engineers generally prefer these hands on sessions as they always generate more enthusiasm, and therefore produce better results. From the company’s manufacturing facility at Cavaion, Italy, Baumann are the world’s largest manufacturer of diesel, LPG and electric side loaders.